Myth Roast: Is There One Piece Of Evidence That Proves Evolution? Is There One Piece Of Evidence That Proves Evolution? Time and time again I've had people say to me, "Show me one piece of evidence that proves evolution to be true." What an annoying request. It's a silly request. It's like saying, "Show me one piece of evidence that proves agriculture to be true." Where do you start? Is there one stand-alone example capable of proving agriculture? No, and one of the reasons that evolution deniers make this ridiculous demand is because they don't understand (nor want to know) what the word theory means in science. In everyday language, theory most commonly means hypothesis, or an idea that hasn't been tested. For example, if I found a broken glass on the kitchen floor, in answer to what happened, I could say my theory is that the four year old running around the house knocked it off the counter top. This seems perfectly reasonable since she's knocked over other things during the course of the day. But that is only a hypothesis and looking back through the security footage, I would find that it was in fact the cat that broke the glass. So you see, theory in this sense is just a baseless hypothesis, or educated guess that is prone to inaccuracy. In the scientific community, theory has an entirely different meaning. While laypersons use the word theory to cover multiple meanings, the scientists use less ambiguous language - hypothesis, theory and law. Hypothesis is an idea that needs to be tested and proven. Theory is an explanation of how a particular area of science works. Law is a statement of fact. If a scientific law is ever proven to fail, it ceases to be law. A scientific theory is usually continually being developed and refined. You may hear people say that theories are always changing so you can't trust them, but that is a dishonest statement. When a new scientific discovery is made, it adds to the relative theory, usally filling in gaps or adjusting a small part to a more accurate explanation. 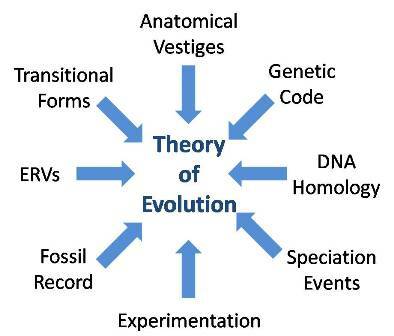 Change in a scientific theory does not mean the entire theory is thrown out and replaced with another theory, which is what evolution-deniers would like you to believe. The same goes for the claim that science is always changing its mind. No, science is always being refined and added to. Let's look at some other applications of the word theory in science. We have gravitational theory. It doesn't mean we're guessing that there is gravity (although flat earth believers would make that claim), it is an explanation of how gravity works, how it behaves, etc. We have germ theory. It doesn't mean we're guessing that there are germs, it is an explanation of how germs behave, how they evolve, how they affect other animals, etc. We have music theory. It doesn't mean we're guessing that music exists, it is an explanation of how different frequencies of sound are produced, behave, interract, etc. And then we have evolutionary theory. It doesn't mean that we're guessing that evolution happened, it is an explanation of how biological life evolved, how natural selection works, etc. So going back to one peice of evidence that proves evolution, the reason we can't provide once piece of evidence is because the theory of evolution is a thorough explanation of the diversity of life. It covers many fields, such as biology, molecular biology, chemistry, paleontology, taxonimy, zoology, and so forth. Just as I can't give you once piece of a puzzle to prove the puzzle is a picture of a tiger, I can't give you one piece of evidence to prove the theory of evolution to be fact because the entire theory of evolution can't be proven with one piece of evidence alone.